There’s a new international trailer for “Star Trek Into Dark Knight” that includes some new footage, most notably/curiously a seemingly gratuitous glimpse of Alice Eve in her underwear that seemingly exists just for the benefit of screencaps. Turns out, it’s JJ “Mystery Box” Abrams playing more advertising games with us, as there’s actually a hidden URL in the background of the scene that leads to… a new poster. Okay, so… I’m pretty-much okay with being “the guy” who still not really onboard with Abrams in general and his version of “Trek” specifically; so I get that anything remotely critical I have to say will be summarily dismissed. Fine. If I couldn’t put up with that, I wouldn’t be in the business. The trailer is pretty good, though I’m not any more persuaded that the problems of the previous installment won’t simply be exacerbated. 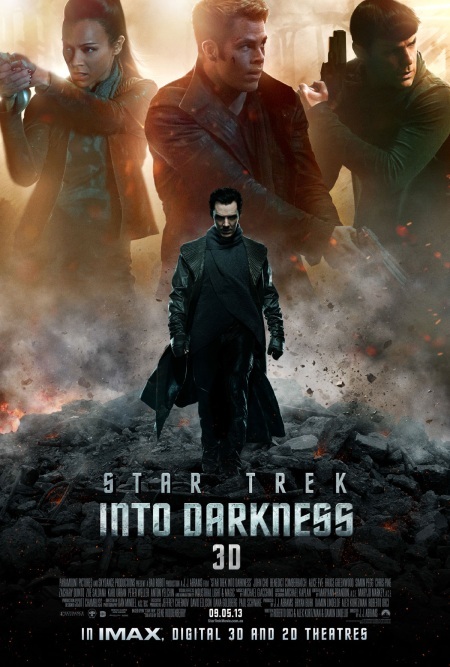 That having been said… my takeaway from this poster is that – moreso than any before it – if you take away the title down the bottom it would be almost impossible to discern that this is supposed to be the poster for a “Star Trek” movie. Is that a problem? Is that a bad thing? I don’t know. It feels like it SHOULD be, but I don’t know. Thoughts?